Indigenous to the planet, the Tusken Raiders, or Sand People, have a long history of violence with Tatooine's more recent settlers. Often regarded as nothing more than savages, the Tusken Raiders are actually a fierce warrior people, living in balance with their harsh desert home and forging deep bonds with their bantha mounts. This post provides more information on bringing the enigmatic Tusken Raiders into your FFG Star Wars RPG game - including downloadable adversary stats, and new abilities. The Sand People can make great low-level foes for an Edge of the Empire game, or be used as highly unusual rivals for an Age of Rebellion game. They can even be used in Force & Destiny as gatekeepers of long lost knowledge, otherwise lost to the desert winds. All Tusken Raiders share an innate racial bond with the great, shaggy bantha, which they use for mounts and - in extreme situations - war. A Tusken Raider will imprint on a particular bantha, and from that point on they are indelibly linked. If either the Tusken Raider or the Bantha dies without the other, the survivor will inevitably wander into the wastes until they perish alone. This link is represented by their "Bantha Affinity" ability. Tusken Raiders are also experts at surviving in harsh, barren environments. All Tusken Raiders automatically receive the "Forager" talent. The most commonly encountered Tusken Raider is the simple minion. Hardly a threat by themselves, they can put up stiff opposition in larger numbers... and a Tusken Raider is almost never known to travel alone. Simple minions are generally only armed with a Gaffi Stick, the traditional weapon of the Sand People. Although they don't like much, in trained hands a Gaffi Stick can be used effectively to defend, and are particularly well suited to delivering dazing blows to opponents. A Tusken Raiders is only ever seen swaddled from head to feet in their traditional padded, desert wrappings and filter masks. These robes not only serve as armor, but help them endure the heat and sandstorms of the Tatooine badlands. 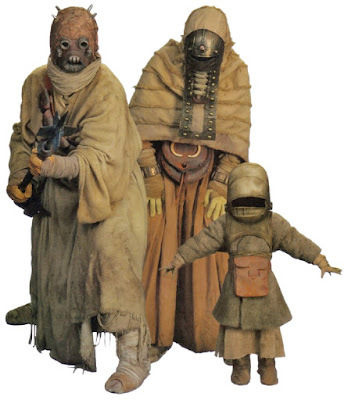 Tusken Raider Huntsmen are responsible for the day-to-day survival of their clan. Skilled hunters, they prowl the twisted canyons and rocky flats of their territory hunting womp rats, eopie, dewbacks, rontos - and even human settlers. In addition to their Gaffi Sticks, a Tusken Raider Huntsman carries his long-barreled slugthrower rifle known as a Cycler Rifle. Antiquated in the extreme, these loud, cumbersome weapons are still capable of taking down prey - particularly if the Hunstman has time to line up his shots from a good distance. Intimately familiar with their hunting grounds, Tusken Raider Huntsman are excellent at chasing down prey and cutting it off at the pass - as represented by his "Outdoorsman" and "Short Cut" talents. An unwary animal, or human interloper, can find themselves ambushed and outpaced if they stumble into Tusken Raider territory. A favorite tactic of Tusken Raider Huntsmen is to snipe foes from long range, then disappear into the terrain, only to harry their foe again later from a different angle. In this way, even a few Tusken Raiders Huntsman are capable of holding off much larger numbers. Tusken Raider Chieftains lead whole tribes of Sand People - holding their position not through wisdom, but through brute savagery. Governing their clans through force and intimidation, the Chieftain is rarely encountered outside of their current campsite - instead feeding off the efforts of their Tusken Raider underlings and living in relative luxury. Less consummate stalkers than the Tusken Raider Huntsman, they are nonetheless a force to be reckoned with in combat. The Chieftain represented here has claimed an advanced hunting rifle as a trophy (pillaged from an unlucky settler), but his real strength is in melee. In close quarters the Tusken Raider Chieftain is able to bring his vicious strength to bear, relying on his Frenzied Attack and Feral Strength talents. Travelers on who are captured by Tusken Raiders may awaken to find themselves in a Tusken Raider campsite, bound and at the mercy of a Tusken Raider Chieftain. There is little hope in reasoning with these barbaric figures - often a captive's only hope is the timely intervention of a well-armed rescue party. Tusken Raiders are widely regarded as unsophisticated savages, and while they do little to disabuse that notion, the Sand People of Tatooine do have a culture all their own. A Tusken Raider Chieftain may rule the tribe, but in any community the most important figure is the Lorekeeper. Lorekeepers are the stewards of the history and mythology of the Tusken Raider race - memorizing the long and complex tale of their kind with perfect accuracy. An illiterate culture, without the oral tradition of these storytellers the Tusken Raiders would lose all sense of history and racial identity. Preserving their past is so important to the Sand People that reciting even a single word of the histories incorrectly is seen as a blasphemy to the race - and a crime punishable by death. As such, Lorekeppers are trained from birth to fill the role. If a Lorekeeper of a tribe dies before they are able to train an apprentice, the tribe is considered to be unworthy of existence, and quickly collapses due to infighting. Due to the perfect preservation of a long history otherwise lost or unrecorded, Tusken Raider Lorekeepers may be sought out as a valuable resource by those looking to learn more about the past of Tatooine.